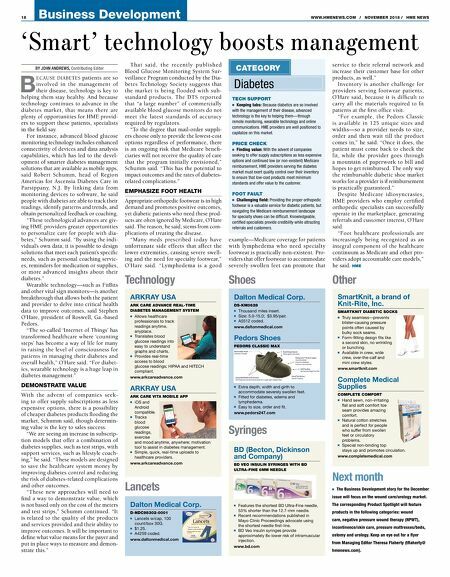 Business Development 18 WWW.HMENEWS.COM / NOVEMBER 2018 / HME NEWS 'Smart' technology boosts management Shoes Technology Other BY JOHN ANDREWS, Contributing Editor B ECAUSE DIABETES patients are so involved in the management of their disease, technology is key to helping them stay healthy. And because technology continues to advance in the diabetes market, that means there are plenty of opportunities for HME provid- ers to support these patients, specialists in the field say. For instance, advanced blood glucose monitoring technology includes enhanced connectivity of devices and data analysis capabilities, which has led to the devel- opment of smarter diabetes management solutions that are available as mobile apps, said Robert Schumm, head of Region Americas for Ascensia Diabetes Care in Parsippany, N.J. By linking data from monitoring devices to software, he said people with diabetes are able to track their readings, identify patterns and trends, and obtain personalized feedback or coaching. "These technological advances are giv- ing HME providers greater opportunities to personalize care for people with dia- betes," Schumm said. "By using the indi- vidual's own data, it is possible to design solutions that meet each patient's specific needs, such as personal coaching servic- es, reminders for medication or supplies, or more advanced insights about their diabetes." Wearable technology—such as FitBits and other vital sign monitors—is another breakthrough that allows both the patient and provider to delve into critical health data to improve outcomes, said Stephen O'Hare, president of Roswell, Ga.-based Pedors. "The so-called 'Internet of Things' has transformed healthcare where 'counting steps' has become a way of life for many in raising the level of consciousness for patients in managing their diabetes and overall health," O'Hare said. "For diabet- ics, wearable technology is a huge leap in diabetes management." 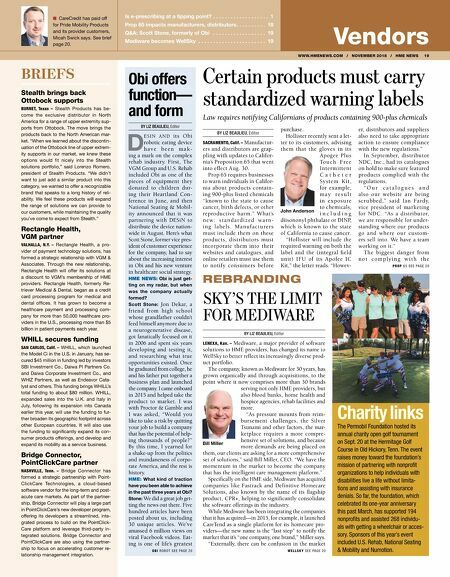 DEMONSTRATE VALUE With the advent of companies seek- ing to offer supply subscriptions as less expensive options, there is a possibility of cheaper diabetes products flooding the market, Schumm said, though determin- ing value is the key to sales success. "We are seeing an increase in subscrip- tion models that offer a combination of diabetes supplies, such as test strips, with support services, such as lifestyle coach- ing," he said. "These models are designed to save the healthcare system money by improving diabetes control and reducing the risk of diabetes-related complications and other outcomes. "These new approaches will need to find a way to demonstrate value, which is not based only on the cost of the meters and test strips," Schumm continued. "It is related to the quality of the products and services provided and their ability to improve outcomes. It will be important to define what value means for the payer and put in place ways to measure and demon- strate this." That said, the recently published Blood Glucose Monitoring System Sur- veillance Program conducted by the Dia- betes Technology Society suggests that the market is being flooded with sub- standard products. The DTS reported that "a large number" of commercially available blood glucose monitors do not meet the latest standards of accuracy required by regulators. "To the degree that mail-order suppli- ers choose only to provide the lowest-cost options regardless of performance, there is an ongoing risk that Medicare benefi- ciaries will not receive the quality of care that the program initially envisioned," Schumm said. "This has the potential to impact outcomes and the rates of diabetes- related complications." EMPHASIZE FOOT HEALTH Appropriate orthopedic footwear is in high demand and promotes positive outcomes, yet diabetic patients who need these prod- ucts are often ignored by Medicare, O'Hare said. The reason, he said, stems from com- plications of treating the disease. "Many meds prescribed today have unfortunate side effects that affect the lower extremities, causing severe swell- ing and the need for specialty footwear," O'Hare said. "Lymphedema is a good example—Medicare coverage for patients with lymphedema who need specialty footwear is practically non-existent. Pro- viders that offer footwear to accommodate severely swollen feet can promote that service to their referral network and increase their customer base for other products, as well." Inventory is another challenge for providers serving footwear patients, O'Hare said, because it is difficult to carry all the materials required to fit patients at the first office visit. "For example, the Pedors Classic is available in 125 unique sizes and widths—so a provider needs to size, order and then wait till the product comes in," he said. "Once it does, the patient must come back to check the fit, while the provider goes through a mountain of paperwork to bill and hopes to get reimbursed. The only way the reimbursable diabetic shoe market works for a provider is if reimbursement is practically guaranteed." Despite Medicare idiosyncrasies, HME providers who employ certified orthopedic specialists can successfully operate in the marketplace, generating referrals and customer interest, O'Hare said. "Foot healthcare professionals are increasingly being recognized as an integral component of the healthcare continuum as Medicare and other pro- viders adopt accountable care models," he said. HME Dalton Medical Corp. DS-KM0628 ■ Thousand miles insert. ■ Size: 5.0-15.0; $3.95/pair. ■ A5512 coded. www.daltonmedical.com Pedors Shoes PEDORS CLASSIC MAX ■ Extra depth, width and girth to accommodate severely swollen feet. ■ Fitted for diabetes, edema and lymphedema. ■ Easy to size, order and fit. www.pedors247.com ARKRAY USA ARK CARE ADVANCE REAL-TIME DIABETES MANAGEMENT SYSTEM ■ Allows healthcare professionals to track readings anytime, anyplace. ■ Translates blood glucose readings into easy to understand graphs and charts. ■ Provides real-time access to blood glucose readings; HIPAA and HITECH compliant. www.arkcareadvance.com ARKRAY USA ARK CARE VITA MOBILE APP ■ iOS and Android compatible. ■ Tracks blood glucose readings, exercise and mood anytime, anywhere; motivation tool to assist in diabetes management. ■ Simple, quick, real-time uploads to healthcare providers. www.arkcareadvance.com SmartKnit, a brand of Knit-Rite, Inc. SMARTKNIT DIABETIC SOCKS ■ Truly seamless—prevents blister-causing pressure points often caused by bulky sock seams. ■ Form-fitting design fits like a second skin, no wrinkling or bunching. ■ Available in crew, wide crew, over-the-calf and mini crew styles. www.smartknit.com Complete Medical Supplies COMPLETE COMFORT ■ Hand sewn, non-irritating flat and soft comfort toe seam provides amazing comfort. ■ Natural cotton stretches and is perfect for people who suffer from swollen feet or circulatory problems. ■ Special non-binding top stays up and promotes circulation. www.completemedical.com Dalton Medical Corp. D-NDC98302-0001 ■ Lancets w/cap, 100 count/box 30G. ■ $1.25. ■ A4259 coded. www.daltonmedical.com Lancets Syringes BD (Becton, Dickinson and Company) BD VEO INSULIN SYRINGES WITH BD ULTRA-FINE 6MM NEEDLE ■ Features the shortest BD Ultra-Fine needle, 53% shorter than the 12.7-mm needle. ■ Recent recommendations published in Mayo Clinic Proceedings advocate using the shortest needle first-line. ■ BD Veo insulin syringes provide approximately 8x-lower risk of intramuscular injection. www.bd.com CATEGORY Diabetes TECH SUPPORT ■ Keeping tabs: Because diabetics are so involved with the management of their disease, advanced technology is the key to helping them—through remote monitoring, wearable technology and online communications. HME providers are well positioned to capitalize on this market. PRICE CHECK ■ Finding value: With the advent of companies seeking to offer supply subscriptions as less expensive options and continued low (or non-existent) Medicare reimbursement, HME providers serving the diabetes market must exert quality control over their inventory to ensure that low-cost products meet minimum standards and offer value to the customer. FOOT FAULT ■ Challenging field: Providing the proper orthopedic footwear is a valuable service for diabetic patients, but navigating the Medicare reimbursement landscape for specialty shoes can be difficult. Knowledgeable, certified specialists provide credibility while attracting referrals and customers. Next month ■ The Business Development story for the December issue will focus on the wound care/urology market. The corresponding Product Spotlight will feature products in the following categories: wound care, negative pressure wound therapy (NPWT), incontinence/skin care, pressure mattresses/beds, ostomy and urology. Keep an eye out for a flyer from Managing Editor Theresa Flaherty (tflaherty@ hmenews.com).